Only a game like Hitman 2 can give you the feeling of all-encompassing power when carrying a pair of scissors while dressed as a gardener, yet at the same time when armed with a semi-automatic rifle and a knife, fill you with a sense of dread that only a room with 4 bodyguards and your target can give you. This is a game that focuses not on what you have but how you intend to use it. Much like its predecessor, Hitman 2 defies logic. It’s the only game where taking an expired can of spaghetti to a gunfight is, more often than not, the preferred choice. When you look at the fundamental basics of Hitman 2, not much has changed. While most games often need to look at their mechanics and tweak things here and there in order to get the most out of it for the player, Hitman’s formula is already close to perfection. Each mission sees you start with a list of targets to assassinate, a large sandbox area where you procure weapons on-site and then lets you work your way to the target(s) in order to assassinate them without being seen; if possible. The multitude of ways that you can do this is unprecedented, more so than the previous game. While Agent 47 is as bland as they come (despite a strange offish charm that he exudes throughout) the locations in Hitman 2 provides a charm and personality that is almost unmatched. The opening few hours of the game see you traipsing around a beach house, exploring a race track and going knee-deep in the cocoa fields of Colombia. Each level contrasts the last in not just looks and style but also in its ability to allow you to experiment. While there are a variety of scripted ways that you can kill targets, like pushing a statue over and dropping it on their head or loosening a wheel-nut of a car in order to cause a crash, the beauty is that you don’t have to follow these intended routes. One of my proudest moments playing Hitman came after all my best-laid plans failed to materialise. With my intended traps failing to hit and guards cornering me in an outfit that had been compromised, I found my target wading through bushes so high that anyone and everyone was concealed. With time running out, I decided to pepper the spot in front of me with a spray of bullets – the first time I had opened fire in over an hour – with a few grunts and groans and alarms going off either side of me, I received confirmation that the target had been killed and shot out of there in a mild-panic, waltzing knee-high through bushes to the helicopter pad just meters away. It wasn’t a clean kill and it certainly wasn’t silent but Hitman 2 (much like the first game) allows the player to develop scenarios that often result in either pure relief from staying undetected, panic after being discovered, or sheer mental collapse after being killed. 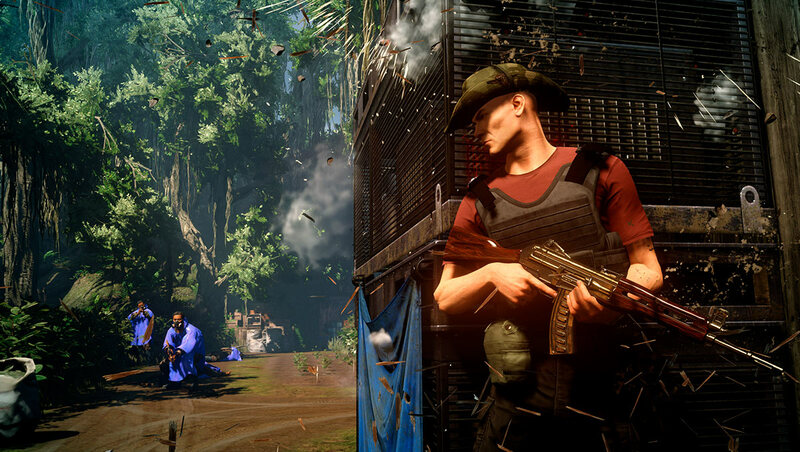 Hitman 2 does what most games struggle to do in a consistent fashion: play with your emotions. From killing a target peacefully, to showering bullets all around, your actions really do result in your own playthrough changing radically. The sheer number of ways to get to your target also means that repeated playthroughs of missions aren’t just recommended but actually encouraged. After completing a mission once, the game will give you new places to start from, new items – and when the game is released and updates go live – new targets to hit. Including world-renowned actor Sean Bean who will appear in Hitman 2’s first elusive targets update. For those who care, there’s a narrative to Hitman 2 that follows on from the previous game but the mostly still cutscenes indicate that its story is an after-thought to actually playing the game. It’s there to link missions together so it doesn’t feel like Agent 47 is just dropping in and killing a couple of people at will but in truth, he really is. The campaign’s narrative is extraneous and does little to add to the game but, it’s there if you want to delve into Hitman 2’s throwaway lore. The differences from its prequel are minimal and focus on small quality of life improvements, rather than large-scale changes. For instance, the game now does a better job of informing you when you’re concealed either in foliage or mingling in a crowd. It also highlights scripted deaths more visibly through on-screen markers, although, this is a feature that you can turn off in order to play the game more organically. It’s a nice touch but stumbling into opportunities without waypoints popping up is, in my opinion, the best way to play the game. The fact that it’s here is a welcome touch to those who may want to take advantage of it in order to see what creative deaths IO have come up with. Levels are also vastly increased in size compared to IO’s previous Hitman game, although thankfully not to the point where it’s too overwhelming. Bigger locations will often have multiple targets spread out in clearly defined sections which makes it feel like three missions in one. Colombia for example, has clear areas that represent the shanty town, large mansion complex and jungle-like areas that feel separate yet connected. All of which are clearly defined but also feel natural inside the same location. There also isn’t a great deal of backtracking involved, unless you’ve left an item in a separate area yourself. In a strange twist of events, Hitman 2 also comes with a competitive online multiplayer mode called ‘Ghost’. This mode allows two players to enter the same area where you’re tasked with killing the target quicker than your opponent. However, players can’t affect the other’s world, with each player unable to truly interact with who they’re up against. It adds to the tension and panic of the normal single-player game and it’s a mode that could have long legs with players who have a great understanding of Hitman’s intricacies and crave more. Targets will always change so there’s no way of having a pre-determined route every time. It’s an addition that will be extremely attractive to those who long to assassinate in a variety of ways for a potentially unlimited amount of time. After splitting from Square Enix, it was worrying as to whether or not Hitman had a future, thankfully, IO has given Agent 47 a game that is in equal parts thrilling, exhausting and liberating, and all while hurling a can of expired spaghetti at a target. In a world where stealth games are few and far between, Hitman 2 is the closest we’re going to get to sneaking around and taking out a target. While hiding in plain sight is different to sneaking around in a box or in permanent night-vision, Agent 47 has a prominent place again in video games.